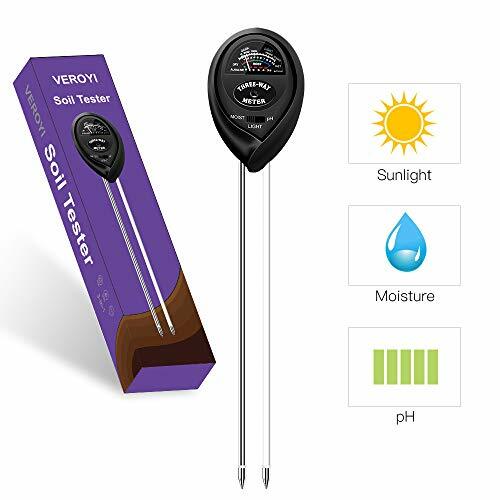 Veroyi ST03 Soil pH Meter -- The Best Plant Assistant for Gardener ! ⌂ Monitor Soil Moisture: Monitor the soil moisture of plant would always help you know about if you need to water your plants or not. ⌂ Detect Soil pH Value: Detect the soil pH level of plant from time to time is very necessary that may help you control the pH value in the soil, improve the growing environment quality of your plants. ⌂ Check Light Level: Check the sunlight level of your plants lets you know if they are getting enough sunlight source and help you make adjustments whether they need more sunlight or not. BEST PLANT ASSISTANT: With our ST03 soil pH meter, you can easily know about the conditions of your plant through monitoring the soil moisture, detecting soil pH value and checking daily sunlight source level. The best plant assistant for gardeners. CONVENIENT TO USE: No batteries required, it's very easy to use by inserting probes 3-5 inches into the soil, toggle the button to switch to Moisture, Light or pH position, wait about 10 minutes for a much more accurate and stable reading. PERFECT FOR INDOOR&OUTDOOR USE: Ideal soil test kits little gardening tools for garden, lawn, farm plants, lightweight compact design makes it perfect for indoor&outdoor use. RISK-FREE WARRANTY: We highly stand behind our products and customers with 12 months risk-free REFUND or REPLACEMENT warranty if you receive a defective tester or any other issue. Please contact us for a satisfactory solution before you decide to leave a negative review or feedback. If you have any questions about this product by Veroyi, contact us by completing and submitting the form below. If you are looking for a specif part number, please include it with your message.